African Oil Palm was first introduced to Honduras in 1927 and by the 1970s there were 11,000 hectares planted throughout the northern part of the country. 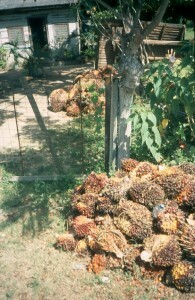 Traditionally, Honduran palm oil has been produced for use in the food industry to make products such as margarine and cooking oil. In 2006, however, the Honduran government launched a five year program to promote the use of agrifuels with the aim of expanding the total cultivation area of 84,000 hectares by 200,000 hectares. Honduras is the biggest exporter of palm oil in Central America, accounting for around 45per cent of its production. About 50 per cent of Honduran palm oil is exported. Most production is still concentrated along the Caribbean coast of Honduras with about 68,000 hectares of palm planted along the coastal plains of Atlántida and the Sula and Aguán valleys. Production and processing co-operatives and multinationals are the main producers (accounting for 68 per cent and 29 per cent respectively). Coral reef contamination – see below. In Atlántida, the oil palm plantations are located where numerous large rivers flow down from the Nombre de Dios mountain range into the sea. This has increased the delivery of sediment, nutrients and other pollutants which impact the Mesoamerican Reef, the biggest coral reef system in the Americas and the second largest in the world. The International Coral Reef Action Network (ICRAN) Mesoamerican Reef project was set up with support from the UN and World Wildlife Fund to provide comprehensive watershed analysis and to examine the impact of different land uses – including palm oil agriculture – on water quality.